Tony Hall has worked in the entertainment industry for 22 years primarily in Northern California where he grew up. His career behind the scenes began with IATSE LOCAL 16 in 1995. 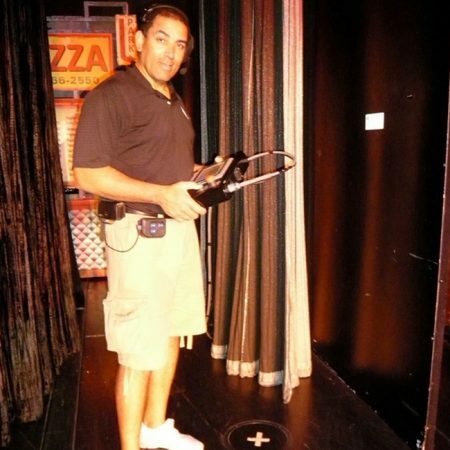 He possesses a wide range of skills from certification rigging automation, a skill he acquired while working with “Flying By Foy.” His production manager training on Royal Caribbean Cruise Line production shows taught him the total scope of theater production, from set construction, lighting design & stage design, to technical director. As technical director, he worked with Rock Legend Cruise’s and the Tom Joyner Fantastic Voyage Cruise, where he was responsible for industrial theatricals and special events. Mr. Hall continued honing his theatrical skills and has been a grip/electrician, gaffer, production assistant, camera operator and director of photography. He has ties to IATSE LOCAL #16, LOCAL #50, LOCAL #134 & BAFA/IATSE LOCAL #119. The majority of his experience has been with Live Sports Television with ESPN and the Sacramento Kings. He has worked on 11 motion picture films including a network drama/detective TV show. He has also worked a host of Broadway Shows. His most enjoyable experience was with Angels in America (off Broadway)and Phantom of the Opera. Hall has worked on music videos, documentaries and independent film shorts. A long list of concerts completes his vitae but are too numerous to list as well as a host of industrial theatrical and special events. His dream is to open a motion picture/television lot…he’ll see you at the movies!